Back in June, Tesla surprised everyone when it announced its plans to buy SolaCity, thus tying a clean energy source to its fleet of vehicles and stationary energy storage and becoming Tesla Energy. A natural step to Tesla's vertical integration philosophy and Elon Musk's master plan part deux. 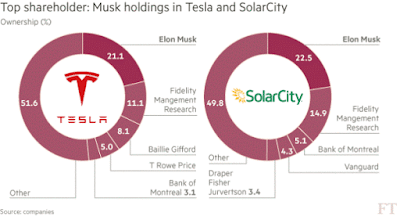 Yesterday, both companies announced that they have reached a deal where SolarCity stockholders will receive 0.110 Tesla shares per for each share of SolarCity, valuing SolarCity's stock at $25.37 per share. That's 0.112 to 0.121 lower per share than when Tesla made its initial overture to SolarCity back in June. SolarCity will now have a 45-day "go-shop" period, which runs through September 14, 2016, to solicit alternative proposals. According to regulatory filing, a termination fee of $26.1 million will have to be paid by SolarCity if it ends the deal with Tesla in order to enter an agreement with a third party, and $78.2 million if SolarCity's shareholders reject a buyout all together. Independent shareholders in both companies still have to sign off the acquisition to finalize the buyout. Tesla's CEO and CTO Elon Musk and JB Straubel as well as SolarCity's co-founder Peter Rive recused themselves from voting. 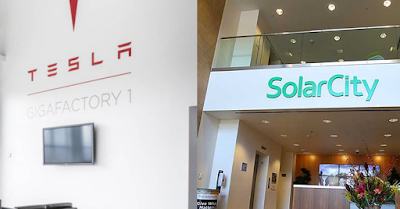 Tesla and SolarCity's joint statement stated that "after comprehensive due diligence in consultation with independent financial and legal advisors, the independent members of the Tesla and SolarCity boards of directors approved this transaction", adding the merger will slash $150 million off SolarCity's costs in the first full year after closing thanks to Tesla's growing national network of 190 retail stores and presence overseas. According to Musk, those looking to buy a Tesla car will have the convenience of purchasing a rooftop solar system as well from the same shop or online without the usual complicated sales procedures. Tesla is expected to save customers money by "lowering hardware costs, reducing installation costs, improving manufacturing efficiency and reducing customer acquisition costs."